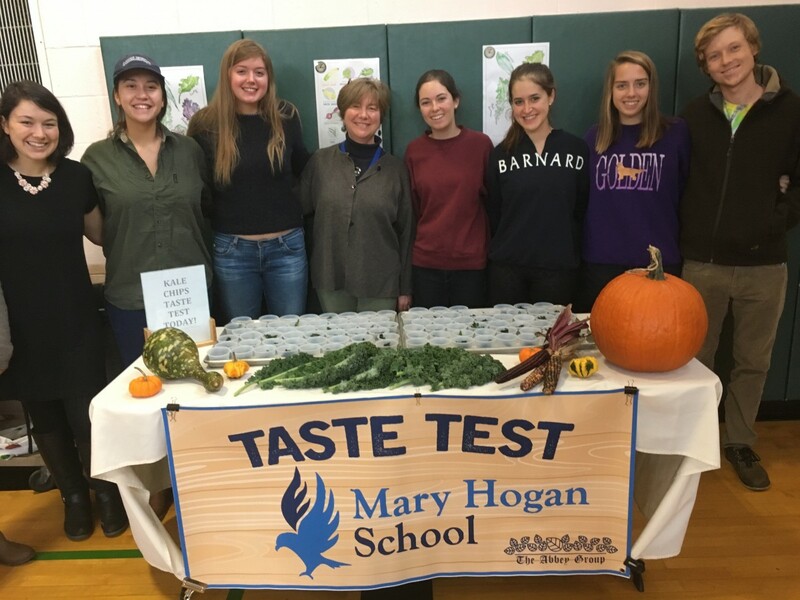 NOM Holds Taste Tests at Mary Hogan! This year during lunchtime Mary Hogan Elementary School is hosting monthly taste tests featuring Vermont’s Harvest of the Month fruits and vegetables. 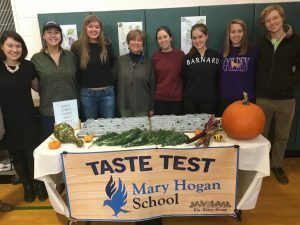 The taste tests are a collaborative effort between Katelyn Jaring, Mary Hogan’s head cook with the Abbey Group, Bethany Yon with the Vermont Dept of Health, and Middlebury College Nutrition Outreach and Mentoring (NOM). October’s Harvest of the Month vegetable was kale and it was prepared for students as kale chips. The morning of the taste test Katelyn, the food service team, and a NOM volunteer prepared enough kale chips to serve over 300 samples. During each lunch period NOM volunteers distributed kale chip samples and students recorded their reactions on taste test ballots. The ballots invited students to rate the kale chips: “Like!”, “Sort of…” or “Don’t like”. Some students felt these options didn’t capture their feelings about the kale chips. They loved them! 61% of the 5th and 6th graders liked the kale chips, 22% sort of liked the kale chips, and 17% did not like the kale chips. In the 1st and 2nd grade lunch period 65% of students liked the kale chips, 20% sort of liked the kale chips and 15% didn’t like the kale chips. The results from the 3rd and 4th grade lunch period showed that 69% of students liked the kale chips, 19% sort of liked the kale chips, and 12% didn’t like the kale chips. Students comments ranged from suggesting that the kale chips would be even better with a little salt, to wanting seconds and even thirds. Some students couldn’t wait to share their experience and newfound love for kale chips with their parents!